Even if a lockout doesn't happen - even if the dispute between owners and players is solved tomorrow - the labor unrest in the National Football League will have ramifications reaching well into the future - for video games. This week, EA Sports and the NFL altered the terms of their notorious exclusive arrangement, which began back in 2005 when the league decided it would have just one video game partner - beginning a policy that's seen exclusive licenses for things like hats, beer and uniform shirts. An almost-certain lockout of players around the time Madden NFL 12 is due for release was the catalyst for the restructuring. Last August, as it became clear there'd be some labor disruption wiping out part or all of the 2011 season, EA Sports asked for a $30 million break on its payments to the league. That's according to the Wall Street Journal, anyway. These two were originally paired through 2012, but this week, the deal was extended another year through 2013, while EA Sports got some kind of discount on at least this year's payments to the league. It appears to be a win-win: EA Sports gets cash relief in a year when it's telling investors that its flagship title may take a dive at the cash register because of the league's overall woes. The NFL can kick the can down the road another year and negotiate this license when its product is a lot stronger. But when the league does sit down with EA Sports, or anyone else, it still may not like what it hears. That's partly because of something else that happened this week: the rumblings that Activision might be eyeing Take-Two Interactive, owners of 2K Sports, with an offer of $22 per share. Granted, it came from an analyst doing what analysts do best - saying what they'd do with another company's millions. But if Take Two is an acquisition target it's not because of 2K Sports, which overpaid Major League Baseball for an exclusive third-party publishing license, a deal the company's chief just can wait to expire. If 2K/Take-Two changed hands, NBA 2K is the only sports game in that shop that's safe. And even if that company isn't acquired in the next two years, it last made a football game of any type in 2007. Given how resentful Take-Two's executive leadership has been of its exclusive arrangement with Major League Baseball, plus the ever-increasing development costs and the layoff between football projects, it's hard to see Take-Two with the will or the cash necessary to kick out Madden and resurrect NFL 2K in 2013. Sorry. It's just not going to happen. It would take a new console generation pushing reset on development to make the gamble worth it and even then, it's probably still too rich for 2K, given that the NFL is one of the world's most valuable brands, sports or otherwise. 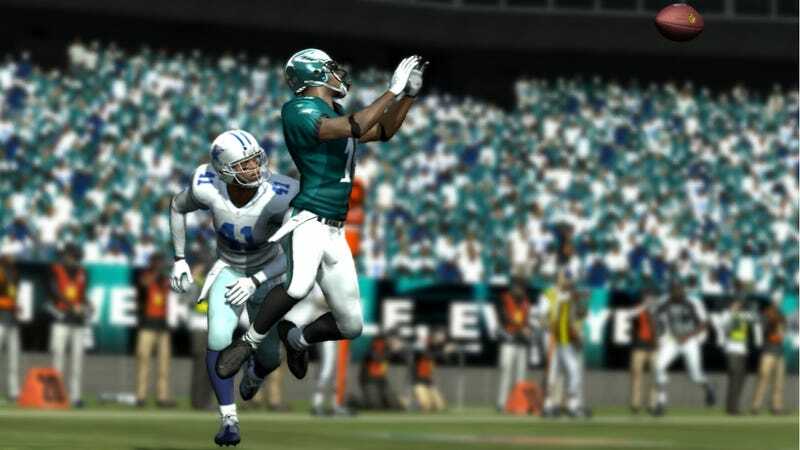 The league's deal with EA Sports is rumored to be second only to its network television contracts. EA Sports has to know this, of course. The NFL owner in charge of the league's business ventures committee said the reworked deal gives a trusted partner short term relief while the league "gain[s] something on the back end." If anyone gains from another year of an exclusive pact - especially at a reduced rate, or even terms negotiated seven years ago - it's EA. And even if the league recovers and Madden's sales weather the lockout and rebound, that's not the total picture of a license's market value. In the past seven years, spinoff products like Madden NFL Arcade and NFL Head Coach, and 2K's The Bigs or MLB Front Office - sensible ideas meant to leverage that enormous investment the company made - have all been disappointments at the cash register. EA Sports will make that known. The NFL made a lot of money on this deal, the first of its kind. But it's different from beer, caps, or shirts. Lots of people make those products, and will go on making them without the NFL's shield. Not so in video games. The league may come to find that it not only eliminated all competitors for EA Sports, it also eliminated all other bidders - serious ones, anyway - for its license.